Brazilian Olympic organizers have told the IOC that the risk of Zika infection will be dramatically reduced during the Rio de Janeiro Games in August. Rio organizers made their final presentation to the IOC executive board on Thursday ahead of the Aug. 5-21 Olympics, which will take place during Brazil's winter. Organizing committee head Carlos Nuzman says the Brazilians showed the IOC a graphic illustrating that cases of the mosquito-born Zika virus drop significantly from June to September. A group of 150 public health experts last week called for the Games to be postponed or moved because of Zika, which has been linked to severe birth defects. But the World Health Organization said there was "no public health justification" for such a move. Nuzman says Zika poses "no public health risk" that would warrant calling off the games. He says several leading athletes, including Usain Bolt, Rafael Nadal and members of the U.S. basketball team, have said they have no worries about going to Rio. American cyclist Tejay van Garderen has withdrawn his name from consideration for the Rio Olympics amid concerns that he may contract the Zika virus and pass it along to his pregnant wife. He is believed to be the first athlete to back out of the Summer Olympics because of the mosquito-borne illness. USA Cycling spokesman Kevin Loughery confirmed the decision and told The Associated Press on Thursday that van Garderen is the only athlete that has withdrawn from consideration for the U.S. cycling team. USA Cycling is expected to announce its road team June 24. Garderen, a member of the 2012 Olympic team, would have been a likely choice for one of the two U.S. spots. The 27-year-old Tour de France veteran is a strong time trial rider and his climbing ability would have been well-suited to the hilly course at the Rio Olympics. U.S. track cyclist Sarah Hammer, who will compete in two events at the Rio Games, told the AP that she is not concerned about Zika but that she is educating herself before traveling to Brazil. "There's always something. In Beijing it was air quality, in London it was security," Hammer said. "Am I worried? No. Am I totally ignorant on it? No. I'm going to take all the proper precautions I need." Hammer has actually been to the Amazon rainforest several times on vacation, though never during such a public health epidemic. But she said "I've always protected myself. And that's what we'll do." Tokyo organizers say there was no discussion of vote-buying allegations during their meeting with IOC officials on preparations for the 2020 Olympics. Leaders of the Tokyo organizing committee gave their latest progress report Thursday to the IOC executive board. It came as French prosecutors investigate payments of about $2 million made by the Tokyo bid team to a Singapore company linked to Papa Massata Diack, son of former IAAF President Lamine Diack. The younger Diack is the subject of an Interpol wanted notice. Lamine Diack, a former IOC member, has been accused by French prosecutors of taking more than $1 million in bribes to cover up Russian doping cases. Tokyo bid leaders have acknowledged the payments but said they were for legitimate consultancy work. The Japanese Olympic Committee has opened its own investigation. Tokyo organizing committee chief Yoshiro Mori tells reporters the issue was not discussed — "not at all" — in the meeting with the IOC board. 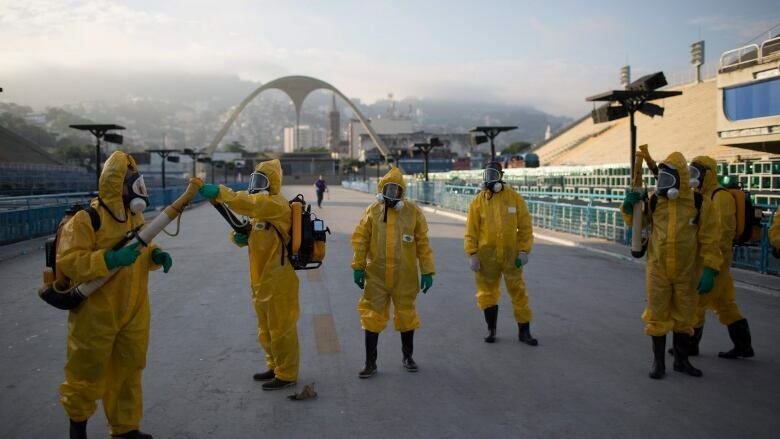 IOC leaders are set to review the final stages of preparations for the Rio de Janeiro Olympics amid concerns over the Zika outbreak, delays in completing a key sports venue and challenges posed by Brazil's political and economic crisis. With less than two months before the Aug. 5 opening ceremony in Rio, Brazilian organizers are delivering a report to the International Olympic Committee executive board. Organizing committee head Carlos Nuzman will present the report to the board in Lausanne, with Rio Mayor Eduardo Paes speaking by video conference from Brazil. IOC President Thomas Bach plans to visit Brazil from June 14-16 to check on Rio's preparations for himself. He will also meet in Brasilia with acting President Michel Temer, who took over last month after Dilma Rousseff was suspended pending a Senate impeachment trial. Brazilian organizers have assured the IOC that construction of the velodrome will be completed by the end of June and be ready in time for the Rio de Janeiro Olympics in August. While most Rio venues are ready, the $43 million indoor cycling track has faced serious construction delays. UCI President Brian Cookson said last week he remains "very, very concerned" about the venue, and the city announced Monday it is changing contractors to take over the project. The issue was discussed Thursday during Rio's final presentation to the IOC executive board before the games. Organizers say Rio Mayor Eduardo Paes gave assurances that the velodrome would be "up and running" by the end of the month. Rio officials told the IOC executive board they've sold 67 per cent of Olympic tickets, or 4 million out of the 6 million available. Rio spokesman Mario Andrada says "at this rhythm we are totally confident we will have a sold-out Games." He says sales have increased after organizers held special days to offer packages of high-demand tickets, including for swimming and basketball. Ticket sales for the Paralympics, however, have reached only 24 per cent. Organizers of the Rio de Janeiro Olympics say they briefed the IOC on water quality improvements for the sailing and rowing venues. Water pollution has been a major concern in the Guanabara Bay, where the Olympic sailing competition will take place, and the Rodrigo de Freitas lagoon, site of rowing and canoe sprint events. Rio organizers discussed the pollution issue Thursday in their final presentation to the IOC executive board before the Aug. 5-21 games. Spokesman Mario Andrada says organizers listed recent anti-pollution efforts will ensure "athletes will compete in clean safe waters in the games."